“A cactolith is a quasihorizontal chonolith composed of anastomosing ductoliths whose distal ends curl like a harpolith, thin like a sphenolith, or bulge discordantly like an akmolith or ethmolith.” This was said – tongue-in-cheek – by the USGS scientist Charles B. Hunt, in his paper about the Henry Mountains region, in 1953. He was in fact describing an actual geological feature – a laccolith which he saw as resembling a cactus – but he was also commenting on the absurd number of “-lith” words in the field of geology… 😉 We are not going that deep into the “lith”ology but can’t help mention a few of them. Unfortunately, scientists are not yet able to “see” what happens in Earth’s interior, but they are on the right path… Computer modelling has made great progress. Measurements of sound waves’ speeds, magnetism and x-ray, and satellites, provide data to help us imaging internal features. Also much experimental modelling has been done in laboratories. All this gives us a good idea why and how intrusions happen (see emplacement methods below). Yet there are still many questions and disagreements discussed among scientists. Plutons that have been pushed up to the surface by geologic forces are subjected to heavy erosion. One of the most conspicuous forms is Spheroidal weathering (also called woolsack or concentric weathering). It occurs in jointed rocks, where the blocks are eroded along and from the edges of the intersecting joints inwards. Geological exfoliation of a granite dome in the Enchanted Rock State Natural Area, Texas. Another form is the creation of exfoliation domes. They occur where the rock surface of a now denuded pluton, by release of its former pressure, expands faster than the interior rock. This surface layer separates from the underlying rock along an expansion joint to form a shell. Concentric slabs/shells of rock begin to break loose, forming onion-like layers subparallel to the exterior. Intrusive structures are often classified according to their relation to the country rock they have intruded. If magma has filled up parallel spaces between the bedding planes of the country rock it is called concordant. If an intrusion cuts right across the original strata or foliation it is called discordant. Features of a batholith on the example of the Cornubian Batholith, Cornwall, U.K.. (© University College London) Click! A very large emplacement of igneous intrusive rock, mainly granite. An exposed surface of (mostly) continuous plutonic rock is a batholith if it covers at least 100 km² (40 mi²). The majority of batholiths visible at the surface (in outcroppings) have areas far greater than 100 km². Surfaces are exposed through erosion, helped by continental uplift acting over many tens of millions to hundreds of millions of years. A batholith can be made up of several intrusions. – In scientific terms, a batholith is a large irregular discordant intrusion. 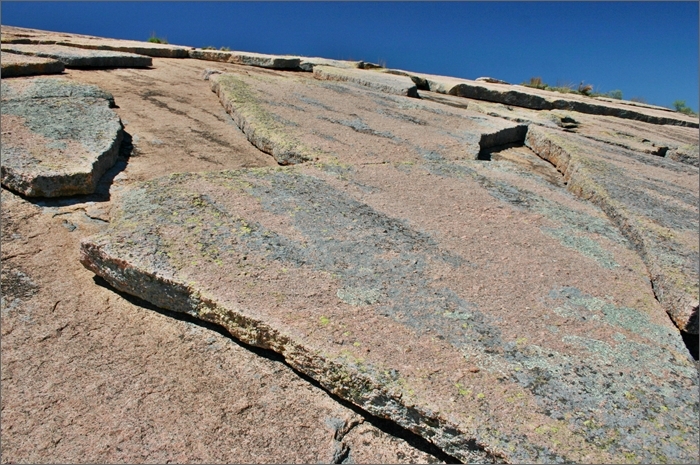 Stocks are narrow shapes protruding from a batholith into cracks in the host rock. They may be an only surface expression of an underlying batholith. They form when most of the magma’s minerals are already solidifying in the bulk mass but some remaining liquids are still creeping forward. Stocks exposed on the surface have areas of less than 100 km². A small stock is a boss. – In scientific terms, a stock is a smaller irregular discordant intrusive body. Composite batholiths are aggregates of numerous batholiths and stocks that cover a vast region. 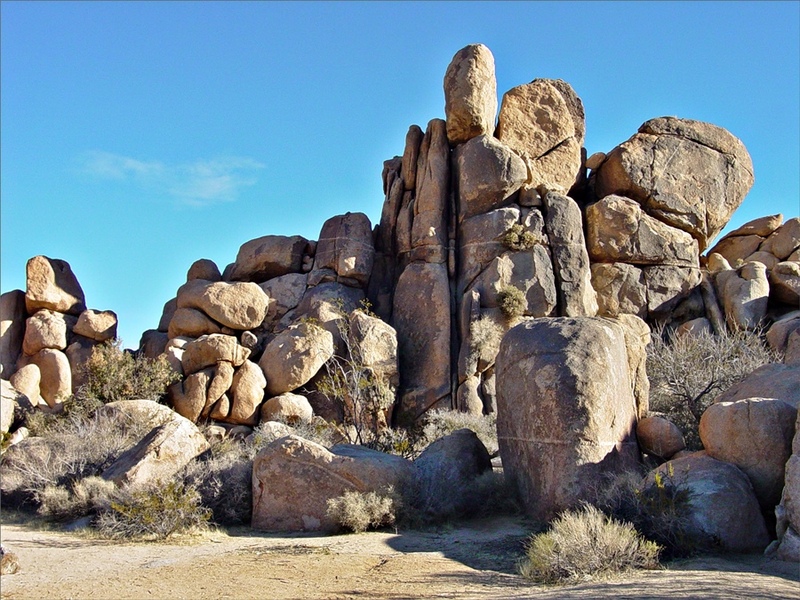 The exposed “heads” can make up entire mountains, as in the Sierra Nevada batholith. 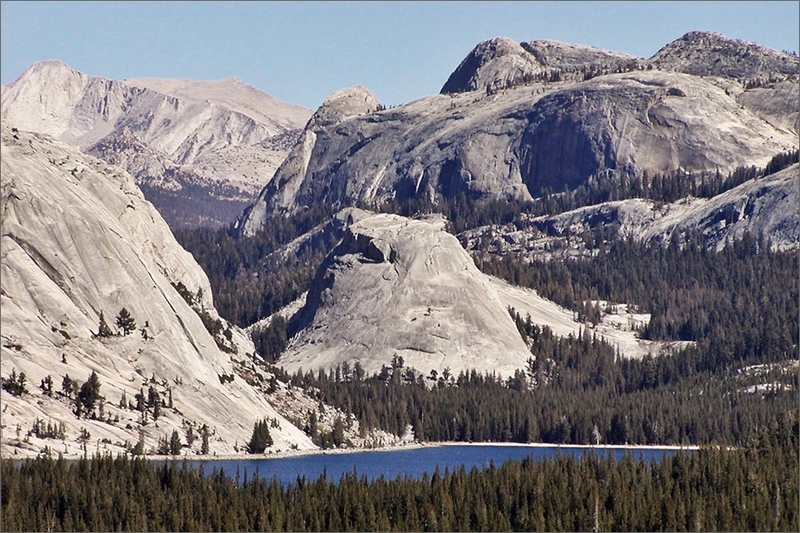 A number of domes are clustered at the upper end of Tenaya Lake, Yosemite NP. Photo of Tenaya Lake and Pywiack Dome, 2004 (© Stan Shebs, via Wikimedia). 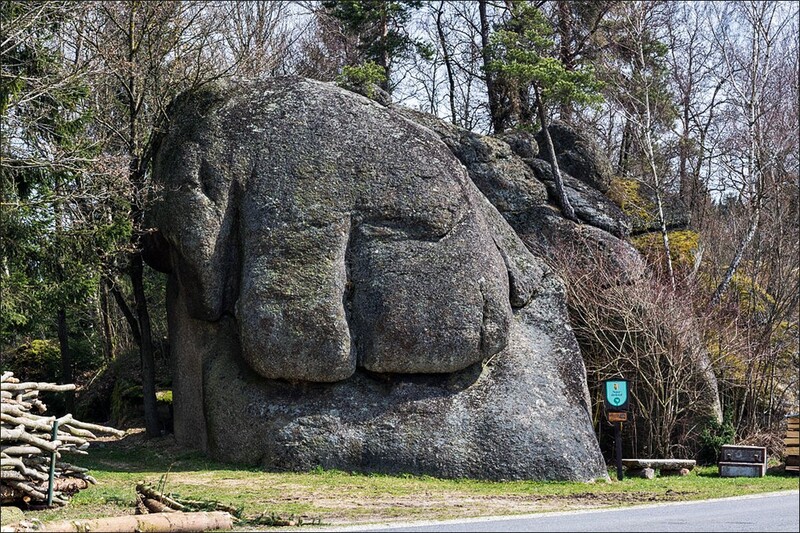 Almost all of the landforms in the Yosemite area are parts of the Sierra Nevada Batholith. More than 50 plutons have been found in the park. An igneous sheet intrusion is formed where a mass of molten magma takes advantage of a pre-existing linear feature in a host rock, such as a long rupture or fault, and forces its way into these spaces. Thus the magma, intruded between existing rocks, solidifies into large thin sheets of igneous rock. For the geologist, emplacement mechanisms of sheet intrusions are key to understanding the transport, delivery and accommodation of magma in the upper crust. A web of granite dikes at the Painted Wall in Black Canyon, Colorado, U.S.. (© Garry and Susan Hayes). The magma must have intruded into a fairly fractured portion of the overlying rock. Dikes are sheet intrusions that cut across layers, or into an unlayered mass. 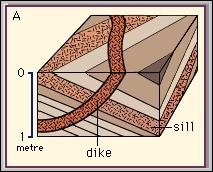 Dikes usually follow zones of weakness in the rocks they travel through. 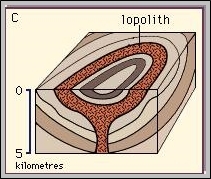 Even if they came to lie horizontal, for example by folding, as long as they cut host rock strata they are still dikes. The rocks in dikes can be both pegmatites (very coarse-grained) and aplites (sugary fine-grained). 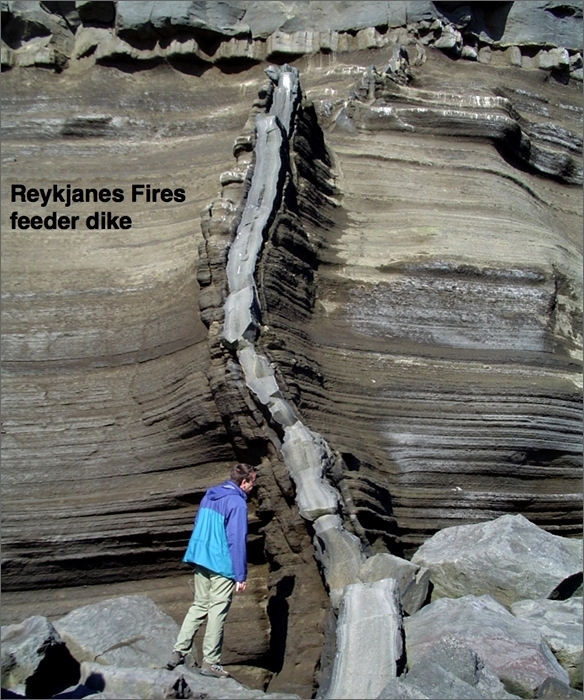 Several dikes together can form a dike swarm. 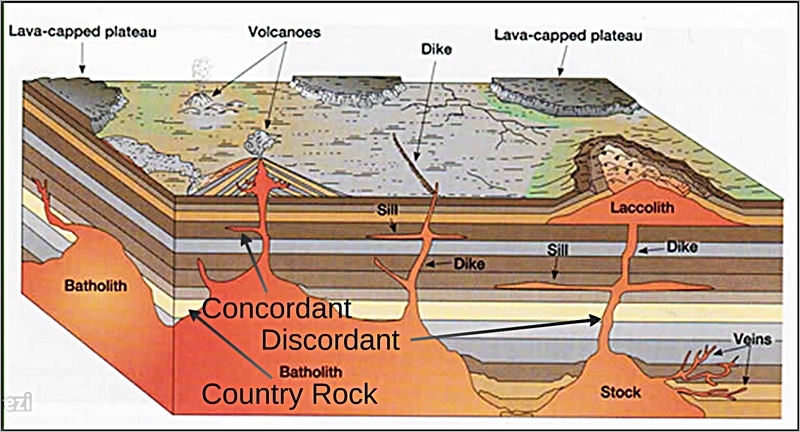 – In scientific terms, a dike is a relatively narrow tabular discordant body which propagates through rock perpendicular to the least principal stress. 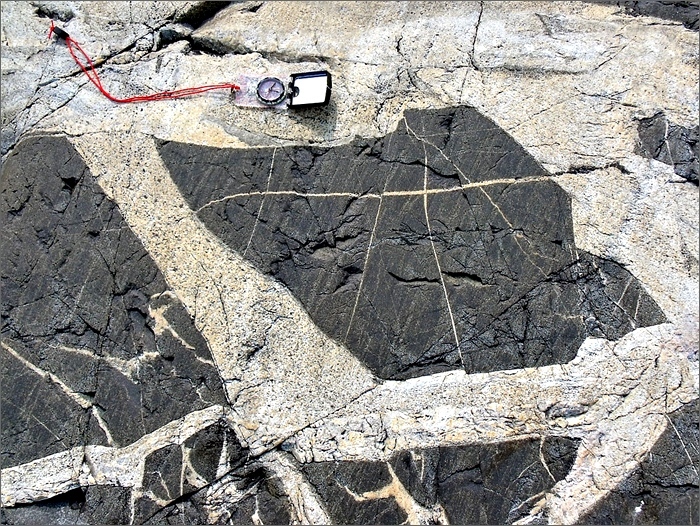 Sheet intrusions that formed between strata in a layered rock mass. They may be parallel, inclined or horizontal depending on the attitude of the strata in which they are intruded. Even if they came to stand vertical by tectonic movements – as long as they lie parallel to host rock strata they are still sills. Sills vary in thickness from a few centimeters to several meters but they are thin compared to their length/width. If several sills are intruded parallel over and below one another (like a pile of pancakes) they may develop into one of the other forms e.g. a laccolith. – In scientific terms, a sill is a tabular concordant body intruded along bedding planes. A ring complex is a general term used to describe an intrusive complex that contains discordant cone sheets and/or ring dikes. – Cone sheets are thin inclined bodies with the geometry of a downward-pointing cone. They are generally just a few metres thick. Viewed from above, their outcrop is typically near-circular. They are often found in partly eroded central volcanic complexes. Their formation is explained as intrusion along conical fractures from the top of a magmatic body into the overlying rocks, caused by high magmatic pressure from below. 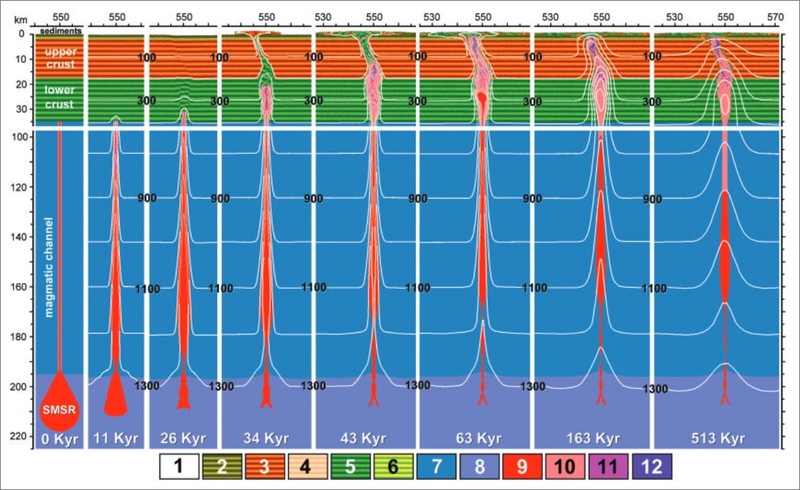 Based on the dip angle and diameter of a cone sheet, the depth of a magma reservoir can be estimated. – Ring dikes. A ring dike consists of an intrusive body that can be roughly circular in plan and has steeply dipping to almost vertical outer margins. Ring dikes are often the results of magma intruding ring faults after a caldera collapse. 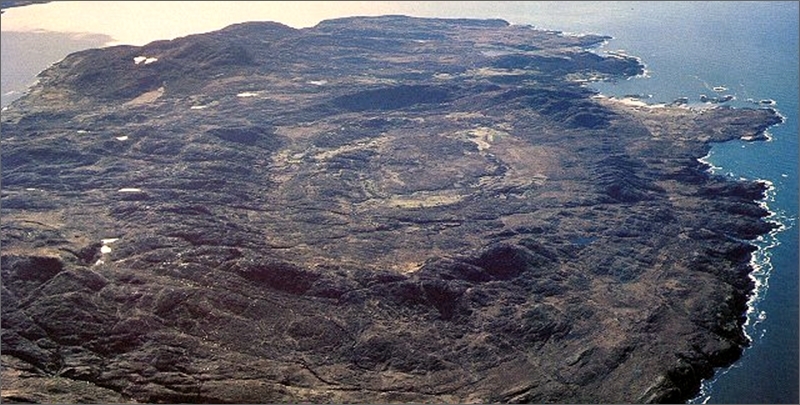 Ardnamurchan “ring dike” in NW Scotland is an example for the difficulty of determining the nature of such intrusions. 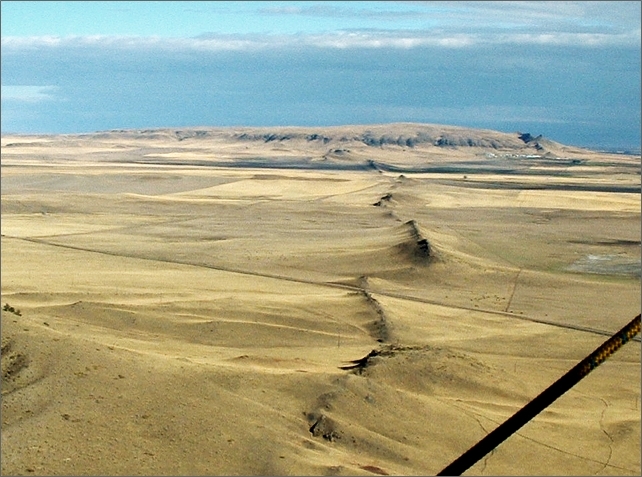 For many decades it has been cited as one of the classic examples for a ring dike after a caldera collapse. Yet, new methods of analysis in 2005 lead B. O’Driscoll et al. to the conclusion that we are actually looking at a lopolith sitting just a few kilometers below the surface. The ring structures have later been found to be cone sheets caused by magma pressure from below. 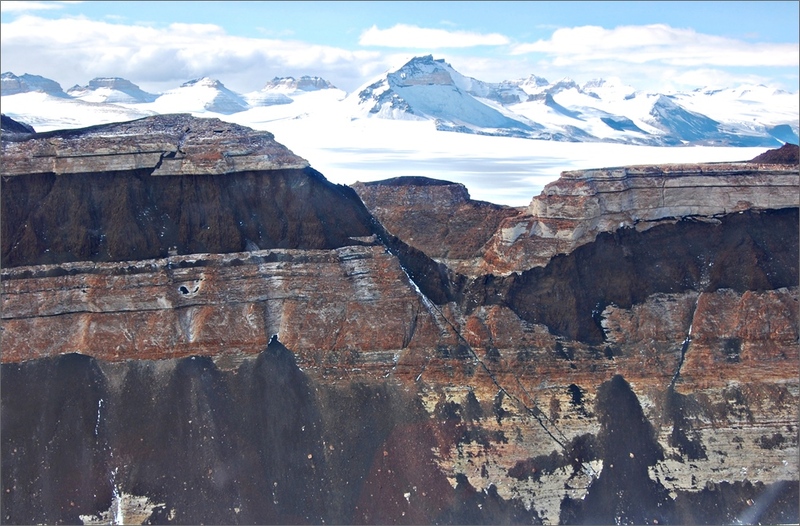 Another paper says that the entire complex is made up of both caldera-collapse ring dikes AND cone sheets (in pushed-up-block fractures) from the underlying intrusion. Those two were emplaced the same way a thin sheet of magma between layers of country rock would form a sill. 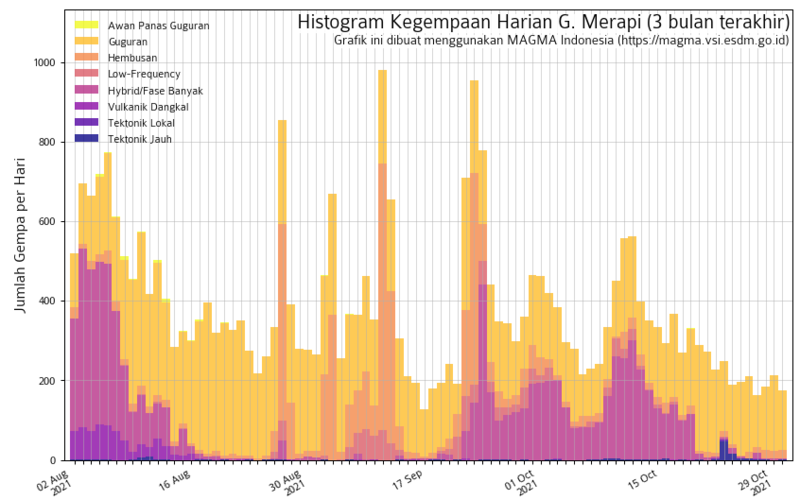 Only in this case the magma accumulated in one place. 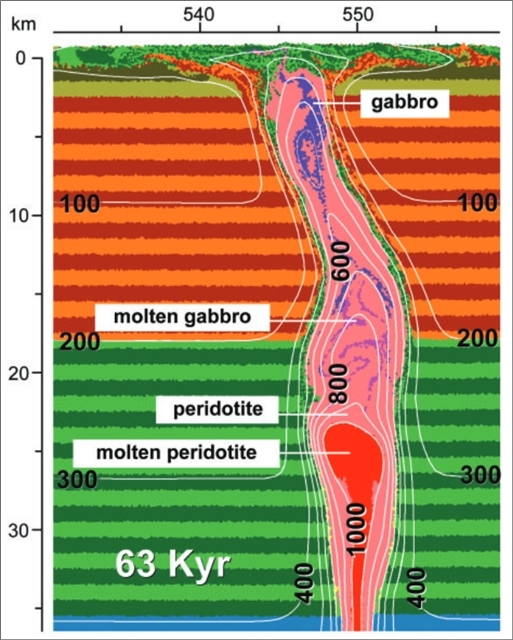 Either because the arriving amount of magma was much greater or the structural conditions of the host rock were such that it could not spread further horizontally. The intrusion has split apart two strata, thereby often deforming the layers around it. 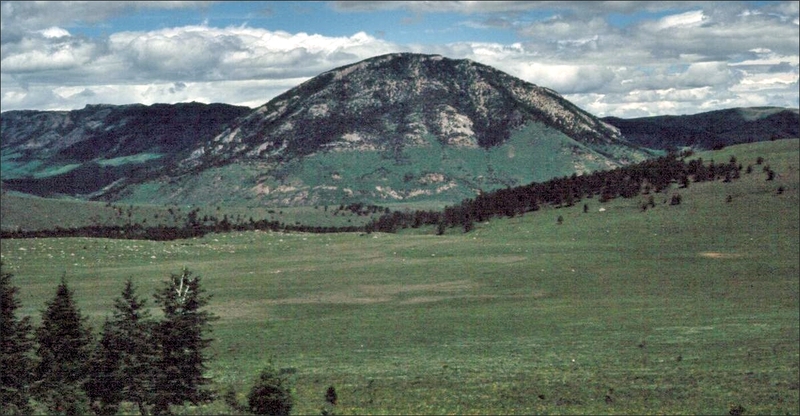 Laccolith exposed by erosion of overlying strata in Montana, near the Stillwater igneous complex; U.S., 1997. (© Jstuby, via Wikipedia). Though laccoliths may come in all sorts of shapes, this one nicely fits the idea of a blob of solidified magma. The result is – for a laccolith – a dome-like structure with a flat bottom, with warped roof layers of country rock above it. 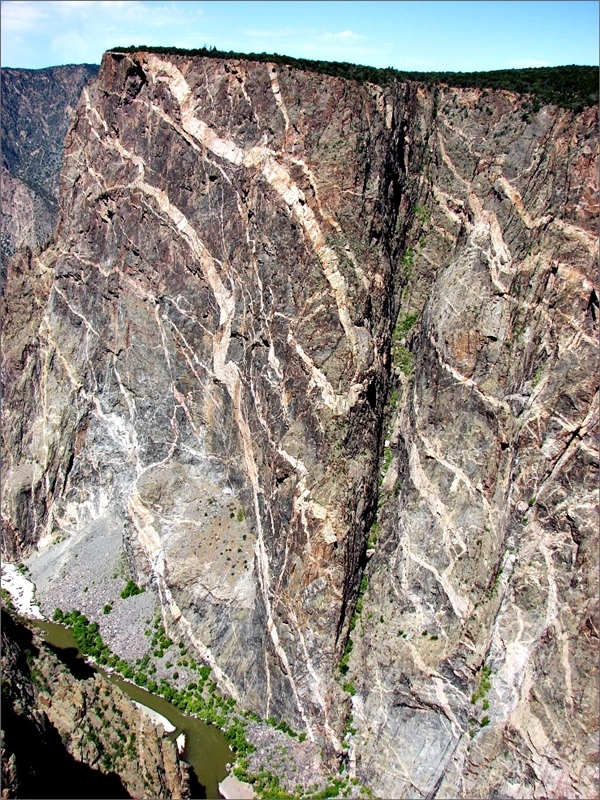 Although the lower portions of laccoliths are seldom visible, they usually are interpreted as having a feeder dike or pipe from a magma source below. In scientific terms, a laccolith is a concordant body with roughly horizontal base and convex top. Its counterpart is a lopolith. 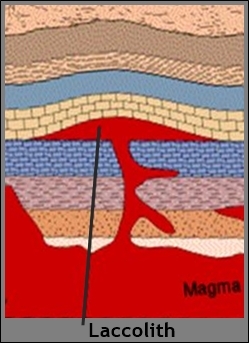 Here the magma also accumulated between layers, but causing them to sag below. The body then solidified in the shape of a bowl or funnel with flat layers of country rock defining the top. In scientific terms, a lopolith is a concordant body with a roughly horizontal top and a shallow convex base. It also may have a feeder pipe below. In scientific terms, a phacolith is a concordant lens-shaped pluton occupying the crest of an anticline or the bottom of a syncline & being fed by a conduit from beneath. – In more popular wording it means that magma accumulated in the troughs or roofs of existing folded layers. Pipes can be tens of meters wide when they were feeders for a large volcano, or narrow if they just fed a small cinder cone, for examples. – In scientific terms, a volcanic neck or volcanic pipe is a tubular roughly vertical discordant intrusive body. 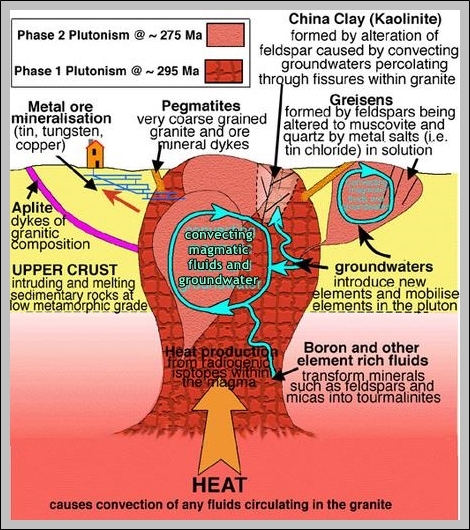 A variety of ways of how plutons get emplaced have been proposed, but not all of the processes are fully understood yet. Stoping, diapirism and ballooning are widely accepted but still debated mechanisms. There is also now evidence of incremental emplacement of plutons. “Diapir” comes from the Greek and means “to pierce.” Diapirism is the upwelling of magma from the mantle through overlying rocks. In this mode of intrusion “blobs” of magma work their way into the crust by softening thin regions of surrounding rock nearest to them. 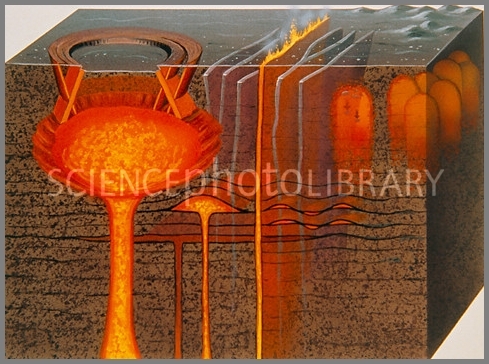 The magma rises because of density contrast and/or internal pressure. Diapirism in the mantle is thought to cause tectonic movements in the crust. It may be associated with the development of large igneous provinces and some mantle plumes. Emplaced diapirs have well-developed internal structures indicative of an origin by flow. Variations in final shapes and internal geometry of diapiric intrusions depend largely on physical parameters like temperature and pressure. Ardara pluton, west coast of Ireland: Simplified geologic map (redrawn from Paterson and Vernon 1995). Color code: purple – granodiorite; olive – tonalite; green – quartz monzodiorite; brown – country rock. 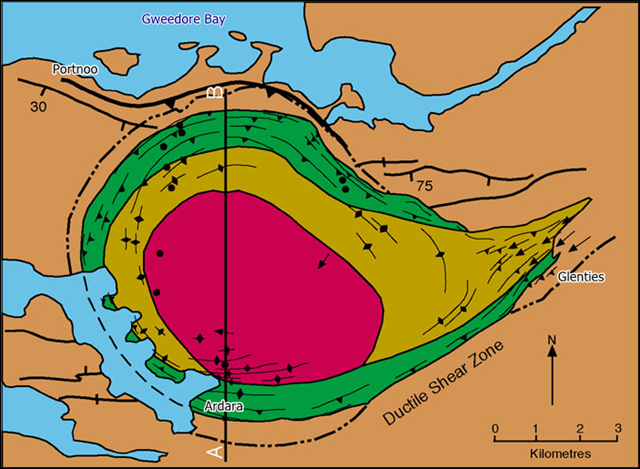 This describes the in situ inflation (radial expansion) of dyke-fed magma reservoirs of roughly spherical plutons. 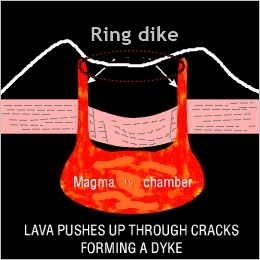 In this proposed model, the magma fills a “chamber” until it loses heat and its outermost margin crystallizes. 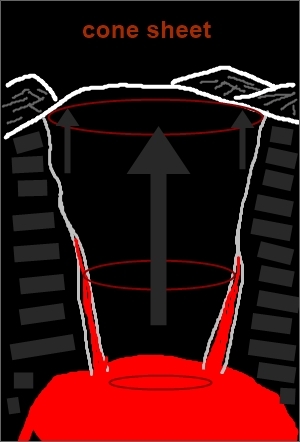 The subsequent emplacement of more magma batches to the same magma reservoir then leads to its expansion or ”ballooning“. 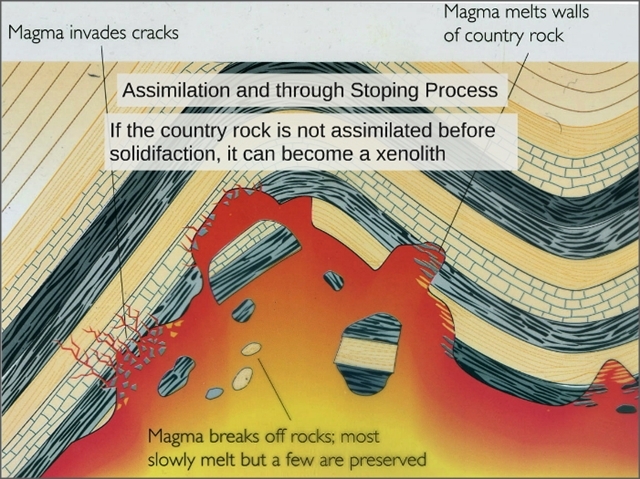 Stoping is the process of igneous intrusion in which magma gradually works its way upward by fracturing and engulfing blocks of the country rock. As the hot magma arrives, the host rock expands and breaks through heat and pressure. Once fractures are formed, melt and/or volatiles will typically invade, widening the fracture and promoting the foundering of host rock blocks. Such stoped blocks may either sink or float. Blocks submerged within the melt are subject to further thermally induced disintegrating which may account for the often argumented “lack of evidence” for the process of stoping. Those stoped blocks that could retain some or all of their original characteristics during the cooling period can later be identified as xenoliths. You have learned a lot about the various intrusive bodies – can you now name the features depicted in this model? Disclaimer: I am not a scientist, all information in this (and any of my other posts) is gleaned from the www and/or from books I have read, so hopefully from people who do get things right! 🙂 If you find something not quite right, or if you can add some more interesting stuff, please leave a comment. Good stuff. Thanks for the broad look at these magnetic processes. Would be interesting to add some geochemistry followed by a discussion of pegmatites and their placement.